Jess Willard may not have been a modern heavyweight, but he was certainly built like one. Standing over six and a half feet tall, the guy towered over the competition of his day. Born in the late 1800s, the man known as the Pottawatomie Giant had actually worked as a cowboy and only started boxing pro in his late 20s. Due to the man’s incredible size and strength, he was able to make his mark on the heavyweight division. Possessed of a terrific jab and, according to the International Boxing Hall of Fame, notable speed, the western giant climbed the ranks of the fight world. Willard really made his presence felt, however, when he faced champion Jack Johnson in Havana in 1915. Fighting in an outdoor venue in well over one hundred degree heat, the fight was most certainly a grueling, if not exciting affair. Indeed, a viewing of the bout can be rather monotonous, as not much seems to happen – until, of course, the 26th round, where a single Willard punch sends Johnson down for the ten count. Johnson, who was well past his prime and clearly out of shape, later claimed he took a dive. Willard replied that, if that were the case, he wished Johnson had done it sooner, since it was so hot in the ring that day. That was Willard. Big, tough, and likeable. The guy went on to hold the heavyweight championship for years, but seems to have been more of a celebrity than a truly active athlete. Willard’s one true successful title defense was against Frank Moran in 1916. Aside from that he performed in – wait for it – Buffalo Bill’s Wild West Show (which was quite the big deal at the time). He also did some circus work. In fairness, it’s said he didn’t want to fight while World War One was raging. While Willard was having his moment in the sun, however, a dark and ominous cloud was heading towards his direction. 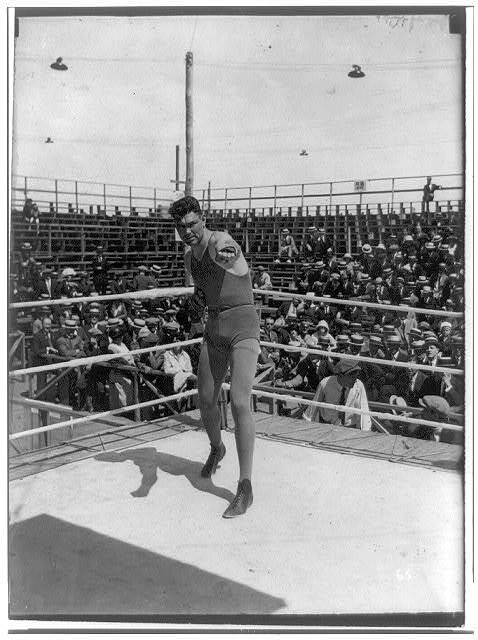 Jack Dempsey was actually born William Harrison Dempsey in Colorado. A drifter with something of a shadowy background, Dempsey brought what could be described as a new style to fighting. Watching old bouts from the late 1800s onward, there is clearly a change in styles when Dempsey (and also Sam Langford) show up on the scene. Whereas boxing was largely an affair which involved a lot of holding in the early part of the 20th century, Dempsey had no time for such niceties. Oh, a fighter could hold Dempsey if he wanted – but he’d actually have to find a way to contain Dempsey in his grasp first. That was hard to do, as Dempsey was violence in motion, a twister tearing apart all in his path. If you want to see the lasting influence of the man, look no further than Iron Mike Tyson. Similar hair style. Similar menacing, enigmatic air. Similar ring entrance. Its clear Tyson studied Dempsey and studied him well. Both were frightening customers. Willard, however, was the man to beat as America and the world headed towards the 1920s. With his enormous size, strength and – yes – skill, it’s hard to imagine someone like Dempsey, who wouldn’t even be a heavyweight by today’s standards, giving him trouble. Yet those who argue that a good smaller fighter can’t beat a good larger fighter haven’t seen the Dempsey-Willard bout. Or maybe they just understand that Dempsey wasn’t just a good smaller fighter, but a great one, and that’s what made all the difference. For Dempsey was more than just an attack dog. He possessed solid defensive skills, as well. On top of that, he was hungry. By the time Dempsey stepped into the ring to face Willard for the heavyweight championship on July 4th, 1919, the man was ready for war. All these years later, it’s safe to assume that the massive Willard had no idea what was coming that afternoon in Toledo, Ohio. For Dempsey ripped into his man from the word go. He dropped Willard not once, not twice, but seven times in the first round alone. That’s seven knockdowns. Of course, it’s important to remember that back then a fighter didn’t have to go to a neutral corner after his opponent hit the mat. Therefore, Dempsey stood over Willard after a given knockdown, only to viciously bang away again the moment he had the chance. It was brutal stuff, to be sure. Dempsey, however, almost lost the fight. After some confusion at the end of the first round, Dempsey left the ring, assuming he’d won. Needless to say, he had to get back before the referee counted to ten. After safely returning in time to resume the match, Dempsey proceeded to bludgeon Willard for the next two rounds. It actually says something about Willard’s heart and strength that he was able to endure such a savage beating for so long. Even giants have their limits, though, and after the third, Willard had simply had enough. By refusing to get off his stool, he gave the heavyweight title to Dempsey, a man considerably smaller, but far, far more violent. Reports have survived in popular culture for years that Dempsey did seriously physical damage to Willard that afternoon. While those reports were most likely exaggerated, the brutality Dempsey inflicted on the man is still notable by today’s standards. There was another rumor concerning the fight, though, one which doesn’t seem to have entirely been put to bed, which is far more disturbing. That rumor? That Dempsey had his gloves loaded that day. If true, what Dempsey did to Willard would literally be a crime. Here’s the thing, though – it’s probably not true. There’s no real evidence out there to strongly suggest or even imply that Dempsey had anything in his gloves that day other than his own potent fists. The truth is most likely that Dempsey simply caught the bigger man by surprise, in the process laying down a first round thrashing Willard was unable to recover from. Willard and Dempsey were simply two men from different eras of boxing – and Willard’s era was just no match for the one Dempsey helped ring in.